The supply chain and logistics sector is set to grow in the coming years. Tech analytics firm CB insights says $5 billion will be invested this year alone – which is an astounding 1,300% jump from what it was just three years ago. Accordingly, there will be more service providers offering their services, and increased competition among them. Every industry has different expectations of a freight forwarder. In some businesses, the freight forwarder’s role is limited to transporting cargo from point A to point B at a competitive rate, whereas other businesses may use freight forwarders for more than shipping their goods. Regardless, all businesses want to work with a trusted freight forwarder who will help them grow. Capacity: Is the prospective freight forwarder big enough to handle the volume of shipments required by your business during peak season or an unexpected, but urgent large volume shipment request. Industry Specialization: Rules and regulations regarding products that can be shipped vary from country to country. A good freight forwarder will have sufficient knowledge and awareness of mandatory shipping documentation requirements. Global Reach: Freight forwarders with a good network of agents at overseas ports can help ensure your shipments move ahead without delays. Tracking Capabilities: It is essential to have a complete view of the cargo transport details, status of current and pending orders, at any stage during the transit of goods. Documentation: Freight forwarders must be highly organized in the] documentation process of shipping goods in and out of the country. Mistakes in documentation can prove costly. Processing and claiming insurance in such circumstances wastes time and resources. Packaging expertise: Packaging is an important facet of a good freight forwarder. Some goods are fragile and other goods may require special packaging. 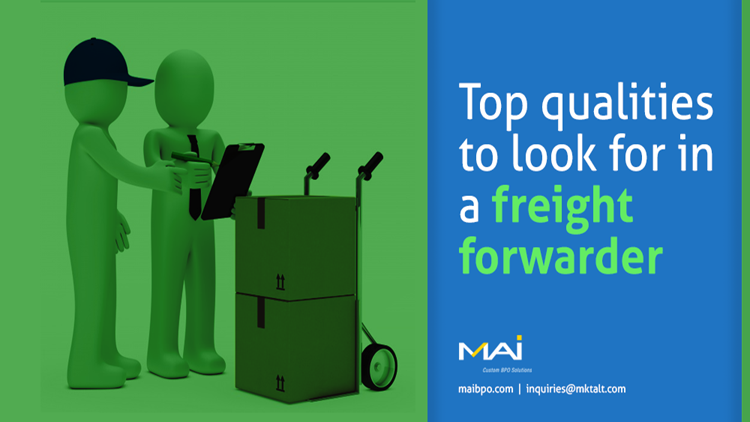 Freight forwarders should have specialists to pack goods according to the product requirement. The products should have primary and secondary layers of packaging to ensure safe transport to the retailer or end customer. Good Insurance Coverage: Ensure that the forwarder has a high level of cargo insurance so that damage or loss of shipment is properly compensated. Financially Independent and Prompt: In situations where the business has paid the freight forwarder, they should promptly pay the ocean carrier for smooth transport. Ask for references: It is always best to make decisions based on positive reviews or word of mouth when deciding your logistics partner. Pricing: It is also important to partner with a freight forwarder who provides competitive pricing. A freight forwarder who works efficiently, provides excellent information flow and who is always aware of the customer’s cargo status will become a trusted and valued business partner.